Thopia family was one of the most powerful Albanian feudal families in the Late Middle Ages. It was initially part of the nobility of the Angevin Kingdom of Albania. 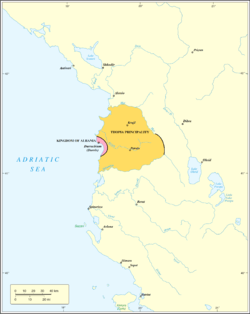 The first mention of the Thopia is from 1329, when Tanusio Topia was mentioned as one of the counts of Albania. In 1338, Tanusio was mentioned as Count of Matia (conte di Matia). According to Anamali & Prifti, Tanusio had a brother, Dominik, who was a high cleric and served as a counsel of Robert of Anjou. According to Karl Hopf, Tanusio's son or brother Andrea, as told by Gjon Muzaka (fl. 1510), had fallen in love with the daughter of Robert of Naples when her ship, en route to the Principality of the Morea to be wed with the bailli, had stopped at Durazzo where they met. Andrea abducted and married her, and they had two sons, Karl and George. King Robert, enraged, under the pretext of reconciliation had the couple invited to Naples where he had them executed. The family converted from Eastern Orthodoxy to Catholicism. Under Karl Topia the family reached its zenith. 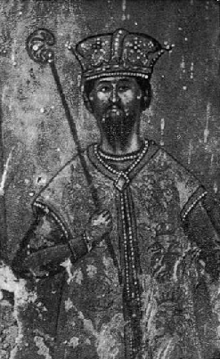 After the death of Emperor Stefan Dušan (1355), Karl managed to capture much of central Albania which was part of the Serbian Empire until then. In 1362 his forces attacked the city of Durrës, then in Angevin hands. Although he couldn't capture the city, he forced them to pay an annual tribute to his family. In 1368 Karl managed to capture the city of Durrës. Around 1370 Karl attacked the dominions of the Muzaka family and managed to capture from them the territory between Shkumbin and Seman. Now the territory of Thopia extended from Mat river to Seman, reaching its maximum extension. This aggressive behavior brought a complicated situation and many enemies. In 1376 Louis of Évreux, Duke of Durazzo who had gained the rights on the Albanian Kingdom from his second wife, attacked and conquered the city. However, in 1383, Karl Topia took control of the city again. Muzaka family allied with Balša II against Thopia. In the beginning of 1385, the city of Durrës was captured by Balša II in a surprise attack. Karl called for Ottoman help and Balša's forces were defeated in the Battle of Savra. Topia recaptured the city of Durrës the same year and held it until his death in 1388. Afterwards, the city of Durrës was inherited by his son Gjergj, Lord of Durrës. In 1392 Gjergj surrendered the city of Durrës and his domains to the Venice. After the death of Karl, his dominion was divided between his daughter Helena Thopia and his son Gjergj Thopia. Gjergj kept the city of Durrës and his surroundings which he later surrendered to Venice Republic, while Helen Thopia kept the city of Krujë and its surroundings. She was married to Venetian nobleman Marco Barbarigo. The count Niketa Thopia, a cousin of Gjergj, ruled in the region south of Durrës. In 1403, Niketa Thopia managed to capture the city of Krujë from his cousin Helena, thus gaining another part of the territory previously held by Thopia. He had good relations with Venice which was interested in having some buffer zone between them and advancing Ottoman army. However, in 1412, Niketa Thopia suffered a heavy defeat from the forces of Teodor II Muzaka. He himself felt prisoner and with the intervention of Ragusan Republic he was released, but only after giving some territories around Shkumbin river to Muzaka family. Upon his death in 1415, the castle of Krujë felt to the Ottomans. Later well known representatives include Tanush Thopia a famous commander of Skanderbeg army and the commander of Krujë garrison during Second Siege of Krujë. ↑ Johann Georg von Hahn (1867). Reise durch die Gebiete des Drin und Wardar: im Auftrage der K. Akademie der Wissenschaften unternommen im Jahre 1863. Aus der Kaiserlich-Königlichen Hof- und Staatsdruckerei. p. 282. ↑ Émile G. Léonard (1932). Histoire de Jeanne 1re, reine de Naples, comtesse de Provence (1343-1382): La jeunesse de la reine Jeanne. Imprimerie de Monaco. p. 107. ↑ Bollettino della Badia Greca di Grottaferrata. Scuola Tipografica Italo-Orientale "S.Nilo". 1978.